Give Me Your Custom Jewelry Challenge! In my jewelry store in Portland, Oregon, I tend to focus on designing custom engagement and wedding rings using precious metals. But really, my expertise is such that any custom piece of jewelry is my forte. I have experience with just about everything you can think of using precious metals! I recently completed a handmade chain from precious metals. I’ve made a belly button ring. I’ve designed and crafted custom cufflinks to match a wedding band. I’ve even done a beautiful 14k gold necklace pendant to look like a book. Very unique stuff! Out of the box thinking! My keyword is custom! I really love the process and the challenge (and the JOY) of creating custom pieces. Creating something that no one else has and bringing into reality something that the client could only imagine in their mind and heart. Bring me my next challenge and let me show you that the design you’ve been thinking about for years can be hanging around your neck or glistening on your finger in a few weeks. Do Little Kids Need Jewelry? As a jeweler in Portland, Oregon, I mostly deal with individuals looking to get jewelry for themselves, their significant others, or close family members. But occasionally I also get asked about jewelry for children and young adults. I wouldn’t necessarily recommend designing and purchasing jewelry for kids that are made from precious metals. They are typically expensive, although usually not as expensive as a similar item would be for an adult because less material is used. If you have kids, you have probably witnessed the fact that the “stuff” around them doesn’t always stay where it starts out. A little girl may beg her mom to put a bow in her hair, but 20 minutes later, she’ll pull it out. It’s just the way of things with little kids sometimes. Most kids don’t know the difference between precious metals and good imitations. Or crystals and diamonds. They tend to appreciate any little piece of bling they get to wear. They also don’t usually have occasions to wear finer pieces of jewelry to. Although, depending on your own lifestyle, this may vary. So clearly, there are some exceptions to this general rule of thumb. Of course, the most important exception is that it is always your choice! I’ve known many families to give more expensive items to children and teenagers. Everyone handles this topic in their own way. Each kind of jewelry is different as well. My own daughter wore earrings from an early age. Many other parents are quite comfortable with earrings on younger kids, whereas they would not give them an expensive necklace or ring. I can imagine designing a beautiful matching pair of necklaces for a mother and daughter, for example. The daughter may or may not wear it all the time to begin with, if she is young, but it is something beautiful and special that she will have for her whole life. Family heirloom jewelry has to start somewhere, right? So perhaps this is an instance of a family heirloom starting new and those hypothetical necklaces will be passed down mother to daughter for generations. Who knows? But I like to think that some of my work will be cherished by more than just the ones I make it for. I also hear a lot about weddings and what the brides are planning. Often, as they describe their ring to me, they are describing their personality and their style and that comes out in the wedding decor and events as well. One opportunity for kids to wear jewelry is if they are a part of the wedding party. Ring-bearing boys can have matching cuff links or tie clips with the groom and groomsmen. Flower girls might have earrings or a bracelet that matches the bride and bridesmaids. This is especially true if the young members of the wedding party are the children of the bride or groom. So, in all your planning, consider these differing views and then make the decision that is best for you and your family. If you have questions or want to discuss some custom design ideas with me, I’d love to hear them! The style you want your wedding ring to be will fit your personality and lifestyle. I’ve come to learn this through countless custom wedding ring designs and working with many brides and grooms over the years. And while your ring will be worn for many years to come and your wedding event is just one day, it’s still important for that event, as well as the rest of the jewelry you wear on that day, to match your style. Some women design very unique and gorgeous wedding rings with me. Just imagine how seamless their look would be if they extended those design elements to the rest of their wedding jewelry. This is something that I can and would love to do for you! The elements you put into your ring can be transferred to matching earrings, necklace, even a tiara or barrette for your hair. Imagine this ring style, but in all those other forms, as well. The possibilities are endless! Guys are really into the performance metals right now. They are becoming more and more popular. And my jewelry store here in Portland, Oregon is seeing a lot more sales of them. The precious metals are well known and quite pervasive in the wedding ring industry: yellow gold, white gold, and platinum are the most popular. Performance metals, however, cover a broader range of metals (and even some other materials) that include some very unique and rare combinations and varieties. This is kind of a no-brainer. Most guys have a bottom line about this kind of stuff. And for many, this is the only piece of jewelry they will ever wear. They don’t feel the need to spend thousands of dollars on it. A plain platinum band can cost around $1500, while a fancy performance metal ring might still only be around $900 or less. If you combine metals, it can get more expensive. Or if you have a channel set diamond or two, the price can increase. But the basic materials will still cost less than precious metals. They might still get some scratches but they won’t bend or dent as easily. They are far harder than precious metals. In fact, they are so hard that I don’t actually make them in my store. I can still custom design them for you, but the machines needed to create them are beyond what my shop can house. You really can’t deny how incredible these rings look. They are very masculine. Often very simple and straightforward. A band of whatever width you choose, glossy or matte finished, maybe with some texture, but not much else. It’s a classic, timeless style. They also have some versatility for the men who do want to have a little more shine or detail on their wedding rings. Engravings and combinations using different metals or two-tone styles is popular as well. We sell these wedding rings quite often, yet they are not rings that I make in my shop. Because of their durability, I don’t have the tools necessary to work with them. Precious metals are softer and I am very skilled with them. That is my niche. However, I can still design whatever you want and send it to professionals that I have a business relationship with and who I know do fine work. They are the ones with the expertise and equipment to do it right. That way I can really stand by the product. The tools needed to cut or mill performance metal rings are very large machines - they wouldn’t even fit in my shop. They basically need a plant to manufacture them. They are a different animal! The company who makes the rings for us is very good. All the rings are made in America. They come with an exclusive lifetime guarantee and warranty for craftsmanship and material. They also come with insurance if they are lost or stolen with only a small deductible. No matter what your style and budget may be, I can find or design a performance metal wedding ring that will be everything you need your ring to be: strong, affordable, and as cool as you are! It’s good for me to hear from customers of my store Marx Jewelers in Portland, Oregon. They tell me what they really feel about their experience and this is what motivates me to continue doing what I do. It makes my job a joy to do, each and every day. And I don’t just try to keep my customers satisfied, I want to make them elated, excited, and overjoyed. “I’ve been a customer of his about 4 years now. I’ve had multiple designs custom made for me. Mostly rings. It’s been excellent. I love being successful as I design or find your perfect piece of jewelry. I’m a jeweler. I’m an expert. I can give you tips on how to find and purchase the perfect diamond for your loved one. Nowadays, of course, we have the internet. Most people can do research online about diamonds. Various websites will pop up with knowledge about the four C’s: Color, Clarity, Carat, and Cut. Jewelers often talk about these as if they are common knowledge, but do you know the difference between VVS1 and I2 Clarity? Do you know how to spot the difference between an inclusion and a blemish? Or what letter signifies the least amount of color in a diamond? It’s more complicated than most realize. But I can make it easy for you. In most cases you want to buy a diamond that’s clear or white. If you get a near colorless gem, it won’t have a yellow or pale color. But sometimes that’s easier said than done. If you go to home depot, you can find white paint pretty easily. But then there’s white paint and white paint and more white paint! There are so many different kinds of white, right? The same is true of a diamond. White is not just white, there are different qualities to the white. The colors D-E-F-G-H look white to the naked eye. Even I color is still acceptable and looks white but will appear less white next to a whiter diamond. You probably don’t want to fall below that level. Inclusions are imperfections within the diamond, while blemishes are imperfections on the surface. As long as you can’t see inclusions with your naked eye, you have a good diamond. Anything beyond this is irrelevant to most because you need certain tools to see the imperfections. Most women will be happy with a diamond that appears flawless when looking at it. Carat weight is a measurement of how much the diamond weighs based on a “carat” which is 200 milligrams. Each carat is divided into 100 points and these decimals are what jewelers are referring to when they say a diamond is .54 carats (just over half a carat). Some will prefer a smaller diamond with excellent color and clarity to a larger diamond with inclusions and yellow color. But this is something to discuss with your loved one because each person is different and values different aspects of the diamond. And something to remember is that a .95 carat won’t look that much smaller than a 1 carat diamond, but the price could be dramatically different, all other factors being equal. Larger diamonds are more rare, so the price typically increases with the size of the diamond. The cut or how it’s faceted is what’s really important. The light reflection abilities are strictly a result of human intervention. The diamond isn’t sparkling in nature. Once it has been faceted and cut, however, the light is reflected and the shine and sparkle is magnified. The brilliance of a diamond is a result of human hands. You can pick up a D color, flawless diamond. But if it’s cut badly, I call it a dead diamond. There’s no life. There is no fire. No brilliance. No loudness. It won’t present the same picture. It will still be worth a lot because the diamond is still of a high quality, but the cut is what really shows off the quality of the diamond. 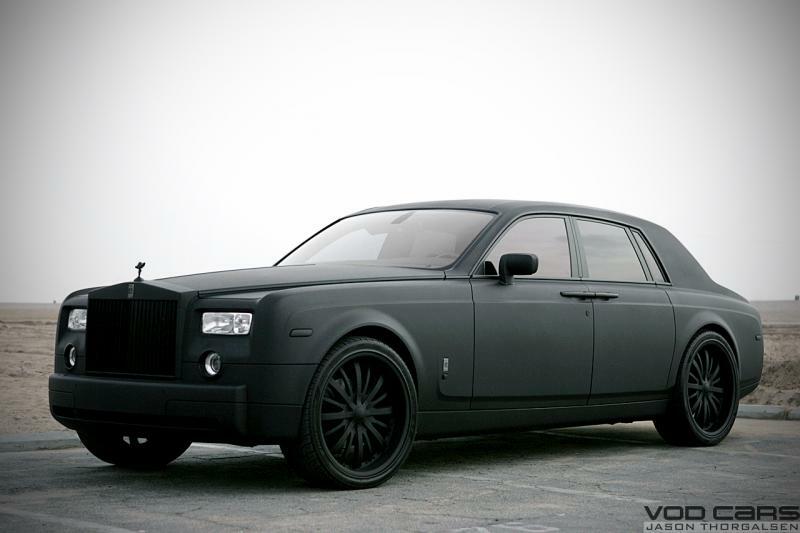 Imagine buying a Rolls Royce that wasn’t painted before leaving the factory… You might not have to pay for the paint even though most of the cost of the car is still there. But imagine the presentation of the car while you’re driving around? Huge difference! So there you have it, simple! Get a diamond that is: D-I color and FL-SI1 clarity, with whatever size you prefer and, most especially, a high-quality cut in the shape that fits your style best. Diverse Diamonds: If you want it, I can find it! Buying a diamond is not about what the jeweler has in his safe anymore. It’s about who he knows and how well he does business with other jewelers and diamond brokers. In today’s world, it’s the jeweler’s world. It’s a huge network and we trade with each other. I have connections all across the US: from New York to L.A. I also have diamond dealer connections in Israel, India, and Russia, to name a few. I might have something that someone else needs and they might have something that I need. We help each other and work together. Any Diamond You Could Desire! Any shape, any size, any color, any clarity - it’s all just one phone call away. And it usually gets to my store in 48 hours! Depending on your budget, you can change the color or clarity a little to adjust the price without making it smaller. Or you might want a very colorless diamond, in which case you might give up a little in size to afford it. My website has a 60,000+ inventory of loose diamonds and a 35,000+ inventory of engagement and wedding rings, as well as other jewelry. Truly, if you want it - I can find it for you! You have a diamond ring and no girl to give it to. You spent money on this ring and now it’s just a reminder that things fell apart. Well after you spend some time getting over the break up, you’ll realize that you’ve got to do something with this ring you bought instead of just sticking it in a drawer and trying to forget about it. Of course, most jewelers would take it back, IF it’s only been a month. Many jewelers and jewelry stores have a 30-day money back guarantee. But as we all know, it might be well after 30 days that you find out the wedding isn’t happening. So what happens then? Well, you’re stuck with the ring. At Marx Jewelers, however, this story has a different ending. Early on, I had some customers come back to me with this situation and I had to figure out what to do. I started thinking about this from the perspective of one of those guys. I’ve been married twice. I understand that it doesn’t always work out. I put myself in the position of those guys and I made a decision. The bottom line is that I want to create a great experience for people even when it’s not so great on their end. So what I decided is to do an unconditional guarantee. If she says no, just bring it back and tell me that it didn’t work out and we’ll give you a 100% money back guarantee. Even though it’s a custom piece. Even though it’s a special order. We’ll give the money back. We figured out that we’ll give it for one year since that’s usually the time frame of most engagements and weddings. We don’t want you to have hard feelings or difficult attachments. As far as I know, it’s pretty unique to our store. I’m not going to say that there aren’t other jewelers that do this but I don’t know any personally. 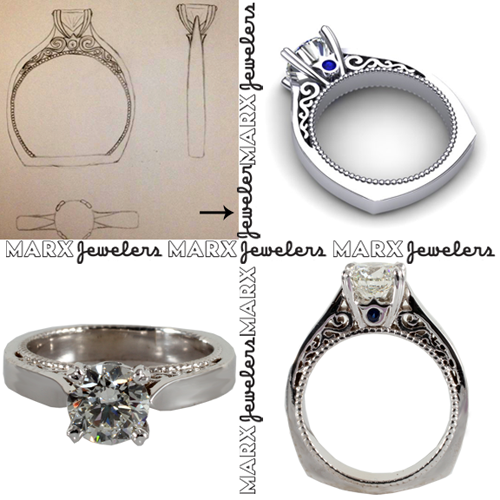 I know that the customer will probably meet someone else down the road and I hope that when he is ready to move things forward with her that he will remember Marx Jewelers. It’s not about making money. When I sell you the ring, I am not just selling you the ring for some money. I’m selling it to you to earn you as a customer. To give you an experience that you will remember happily for years to come. I want to establish a relationship with you. So if you bring the ring back, it’s true that I don’t make money on it, but I still have a relationship with you. That’s what’s important. As always, I hope that your happily ever after goes according to plan. But if you want to have a back up plan in case it doesn’t - why not check us out?! The engagement and wedding rings are one element to consider for your wedding planning. And Marx Jewelers loves to be a part of that aspect of your special day. But what about your dress? Here are two visuals that look at necklines, materials, and wedding gown designs to help you decide what’s best for you. DO YOU KNOW WHERE YOUR DIAMOND CAME FROM? If you are like many of my clients, you may wonder if the diamonds I use in my jewelry are mined, processed, or shipped with inhumane working conditions or through illegal means or if the profits from their sale go toward funding wars and conflicts. I consider myself a jeweler of integrity - and I can proudly say that all of my diamonds are 100% conflict free! Originally living on the other side of the world, I feel like I am a part of a worldwide human family. Not just a single spot on the globe, but connected to many others. Because of this, I also know that it is important to do what we can to ensure fair treatment for all. This is one way that I can make a difference. This term was coined in the 1990s when profits from the diamond business were used to fund civil wars in Africa. Not only were the working conditions of the diamond mining itself deplorable, but the money gained from selling them on the international diamond market gave the warlords and rebels power to destroy many millions of lives. Some of the countries involved in blood diamond trades are: Angola, Sierra Leone, the DRC, Côte d'Ivoire, Zimbabwe, and Liberia. Israel is involved in the cutting and processing of much of the world’s diamonds before they are sent around the world to jewelers, so they are becoming an important part of the conflict-free process. The “KP” is what regulates the diamond industry to make sure they are legal and legitimate. It is a collective initiative made up of governments, industry and civil society. 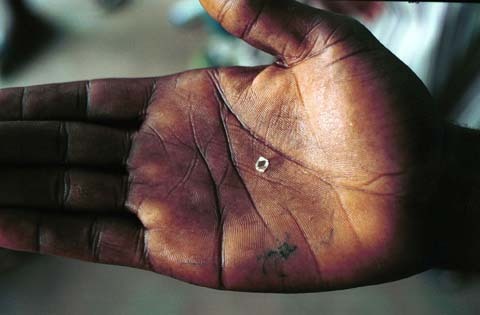 These organizations work to stop the processing and selling of rough diamonds used in funding civil wars. Basically, it is a series of certifications for the processing, handling, and selling of diamonds that is restricted to other companies and individuals who also meet those same requirements. So an individual company must meet certain requirements, and then they can only do business with other companies who also meet them. It does have some stipulations for governments and national regulations as well as on a company and industry level. And for you, the consumer, there is power in your purchasing dollar. Will you support the KP chain of safe diamonds or risk supporting a corrupt diamond source? And if you are still concerned about the mining of the diamond, I can also purchase Canadian diamonds and import them. The diamond mines in Canada are owned and operated by the government and are 100% trustworthy; not to mention being very high quality stones. If that is of interest to you, please talk to me about the details. With Marx Jewelers, you don’t have to worry about where your diamond came from or what was involved in making it as beautiful as it is. With Marx Jewelers, your diamond is just that - YOUR diamond. Peace of mind is a priceless commodity. Don’t leave it up to fate. Buy from a jeweler you can trust.